Petén is considered one of the most important places of pre-Columbian occupation. The department includes two reserves of the Mayan biosphere, seven national parks, five wildlife refuges and four protected biotopes, among other diversity of points to explore, so to know it is ideal to plan several days of stay. It is in this place the legends of the Mayan culture are born, one of the most surprising in the world. On arrival you will find fascinating archeological sites that are surrounded by rainforest that has kept them well guarded, including Tikal National Park that was declared a Natural and Cultural heritage of Humanity by UNESCO in 1979. It means “place of voices” and is one of the largest Mayan cities so far known for its 576 km2 of area. World Cultural and Natural Heritage of humanity since 1979. We can find and appreciate a great footprint of what was this site, with more than 3,000 archaeological elements, a city that inhabited between the Preclassic and classical periods. of its temples and squares, stands out the Plaza Mayor, heart of the archaeological park of Tikal and is surrounded by temples I (Temple of the Great Jaguar) and II (temple of the Masks), the North Acropolis and the Central. There is the square of the Great Pyramid or lost World, a set of monuments of the oldest of Tikal and the palace of the windows, with a lot of interconnected rooms. Temple III or “temple of the Jaguar priest” has different carvings on its lintels. 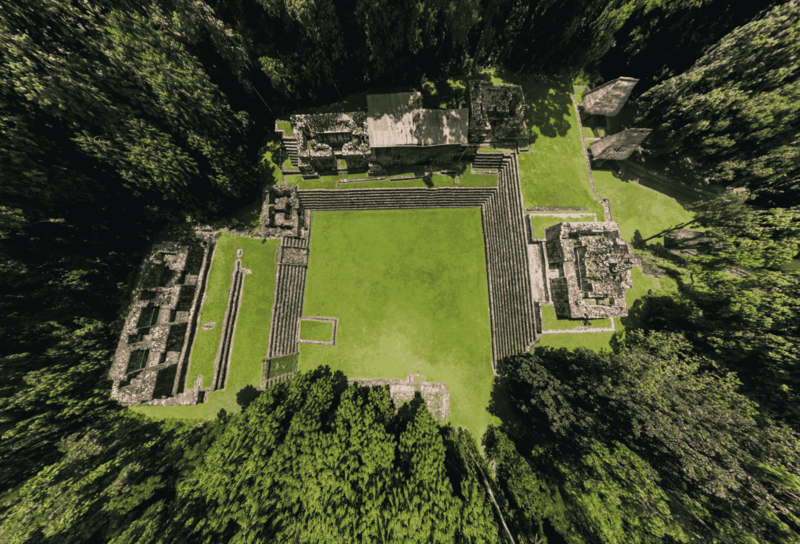 The temple IV or “Temple of the Serpent doubleheaded” is the highest of Tikal, by its 70 meters of height from where we will be able to recreate of one of the most spectacular panoramics of the park. And the temple VI or “Temple of the Inscriptions”, is named after the cover of glyphs in its cresting. The arrival to the park is accessible, so you can enter it with a family or small vehicle. During the trip to the central square we can enjoy beautiful walks, observe different kinds of monkeys such as howler monkeys, coatis, parakeets, toucans, parrots and even jaguars. It means “green water” and in this city there are more than 500 monumental buildings between squares, walkways, astronomical complexes, a commemorative square with two twin pyramids and the Acropolis, an area inhabited by the aristocracy. Currently from the highest monument, Temple 216, you can see the jungle and the lagoons of Yaxha and Sacnab, within the framework of the Mayan Biosphere Reserve. The park is a refuge that allows to appreciate a balanced combination of biodiversity and pre-Hispanic cultural heritage. Due to the presence of impressive lagoons and wetlands that are part of the main migratory bird routes, it has been recognized as a wetland of world importance. In the area there are four main cities, Yaxha, Topoxte, Nakum and Naranjo; They played a very important role in the social and political organization of the central lowlands for more than 1500 years (800 BC-1450 A.D.). It is possible to visit the first three cities, being Yaxha the most accessible and from where you can start the visit to the park. During the walk it is possible to observe different kinds of animals like monkeys and birds. It is located in a natural environment formed by a Sierra Karst and with an extension of 3,000 km2 in which there are ancient Mayan monuments. This biological environment is spectacular for its subtropical forest in which endangered animals and plants inhabit. You can access the park by helicopter or for the more adventurous, walking on a wonderful three-day route. El Mirador is a Mayan city in the north-west of Petén, where you can discover architectural complexes, such as El Tintal, La Florida, la Danta, La Muralla, El Tigre and La Wakna, between its causeways and monumental structures within the Mayan Biosphere Reserve. It is worth mentioning “the Great Pyramid of the Danta”, which is named after the largest animal that populated in the jungle. The Danta is the largest pyramid in the world in terms of volume, occupying a space of 2,800 cubic meters and its height is the highest in America, with 72 meters. The name Ceibal is due to the presence of large numbers of Ceibas in the area. The ancient Mayan city of Ceibal, is located in the municipality of Sayaxché, where it had its apogee between 700 and 900 d. C, ie in the late Classic period. In this archaeological site you can see a variety of Mayan stelae and two structures that are already restored. One of them is a pyramidal temple, in which 5 stelae placed according to the Cardinal points are located. In Stela 10, south Side shows the Lord of Ceibal taking possession in the presence of rulers of large Mayan cities, such as Tikal, Calakmul and Ucanal. The stelae are one of the main attractions, as they are the finest and best preserved of the late Classic period in the Department of Petén in the Mayan lowlands. Taking into account the surprising collection of sculpted monuments and the decipherment of their present texts and iconographic elements, it can be said that Ceibal constitutes a “meeting point among the rulers”, given that in one of the Stelas, they are The emblems of cities such as Tikal, Calakmul (Mexico), Ucanal and Ceibal itself are present. In the year 1985 the site was declared by the Ministry of Culture and Sports as Archaeological park, and in the year of 1995 was declared as protected area with the category of Cultural Monument Management, has an extension of 1512 hectares and is currently Administered by the Ministry of Culture and Sports. In Ceibal we can observe some restored structures, since some of them were composed of perishable materials. You can also see more than 600 structures, as well as different kinds of animals like monkeys and birds. The original name of this archeological site located in La Libertad, Petén is Yo´ki ´ b which means “grand entrance”. Nowadays it is known to the archaeological site like “Piedras Negras”, and it is due to the color of rock that was used for the construction of the different structures. It is one of the largest cities of the classic Mayan period which has approximately 550.000 meters where there are clustered structures. It is an adventure to reach this destination because you must travel by boat through the river Usumacinta, where we can be astonished by seeing different landscapes and animals like monkeys and birds. The park has an extension of 95.529 hectares and was declared as a protected area in 1990. This protected area is one of the areas with the greatest diversity of species in the world and in it live more than 870 species between plants and animals such as the red Macaw and the jaguar aiming to care for and protect these species through preserving the habitat. The mountains with its steep cliffs and interior cave systems condition two of the most impressive features of El Zotz. The name of the biotope is due to the number of bats that we can observe in the area because “Zotz” is the name of this animal in different Mayan languages. The tour is about an hour long, passing through the archeological site El Zotz and culminating in another archeological site called the Devil. From these sites, located in the high parts of the mountains, you can see magnificent views of the Petenera jungle and even the cresting of the LV Temple of Tikal. We also can find different kinds of trees like male xate, Cambray, chicozapote and fat pepper; As well as animals of different species such as Howler monkey, Spider monkey and drum turkey. Laguna del Tigre National Park protects an important sample of humid Tropical rainforest that houses the most extensive freshwater wetlands throughout Mesoamerica. Laguna del Tigre serves as a connection between the east and southwest of the Mayan Biosphere Reserve, which favours the area of singular landscapes, with lagoons and wetlands. Uaxactún is considered one of the oldest cities dating from the pre-classic and classical periods. The architectural evolution of the Mayan lowlands is appreciated and we find inscriptions that date from 328 A.D. to 899 A.D. in different stelae. This Mayan city began to be rediscovered and studied from 1931 when the first formal works were carried out by the Carnegie Institution of Washington. It received the name of Uaxactún or “eight Stones” by Sylvanus Morley, the first investigator to arrive at the place, crossing Nakúm, Naranjo and Yaxha. The word Uaxactún is composed of “Uaxac”, which means eight and “Tun”, which SIGNIFCA stone. Among its archaeological remains stands the structure a-2, a truncated pyramid that could serve to the aristocracy to observe ceremonies, sacrifices and other relevant events. The palace to XVIII, a beautiful temple that has the best panoramic view of the site, was appointed palace for its numerous rooms, and temple by its staggered bodies that form a pyramid that supports a temple from where the ruler officiated the ceremonies. In the palace V or Acropolis were found four graves that are believed to be those of the smoking Frog dynasty. In the group called E highlights its astronomical observatory, used to study the movements of the sun or seasons, to know when to harvest. Located 24 kms. of Tikal. Among its buildings stands the Astronomical Observatory, which served to begin its studies. Here they perfected their writing system.